Hello friends! Wishing you a Happy Friday. Any fun plans this weekend? We actually had a football game last night so I’m looking forward to some time on the couch this Friday evening and catching up on TV from the week, like This Is Us! Then a few other fun things happening on Saturday, follow along on Instagram. But let’s get straight to all things food and fitness I’ve been loving lately for Friday Favorites. You all know M&M’s make an appearance in Friday Favorites every so often. I’m honestly not a huge fan of their flavored candies, but am LOVING these Caramel M&M’s, because well caramel. I ate some by themselves and then added a cup to an oatmeal cookie recipe, so good! Next I’m thinking they need to be added to some brownies. I’m a huge fan of Vital Proteins products. 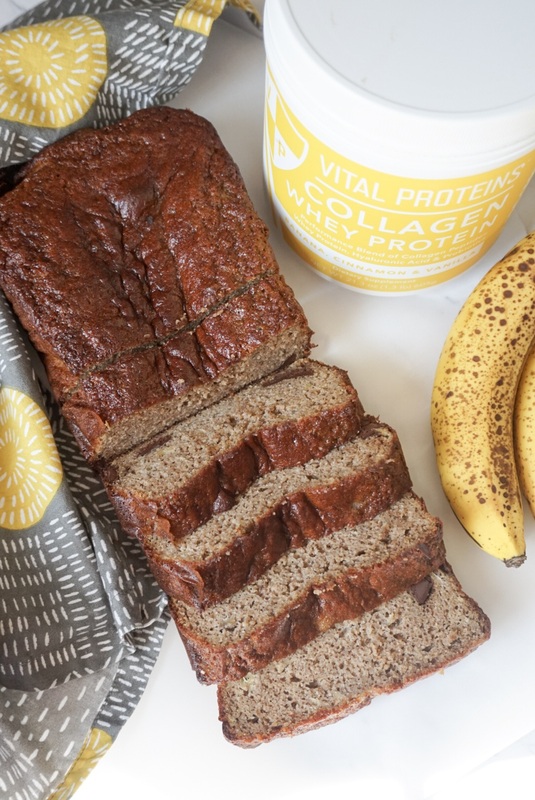 I’ve been adding their collagen peptides or collagen whey to my smoothies and some healthy desserts for a few months, have you tried these No Bake Brownie Protein Bites?!? I’ve noticed a huge difference in my skin being clearer, healthy digestion, and am hoping it will make my hair grow faster and thicker. They recently send me one of their newest collagen whey flavors, Banana, Cinnamon & Vanilla. It’s super tasty by itself in a smoothie, but the other day I decided to get creative. I used a grain free banana bread recipe and replaced 1/2 cup of almond flour with four scoops of the whey. It turned out great! And I had a slice with some almond butter each night this week for a healthy sweet treat. 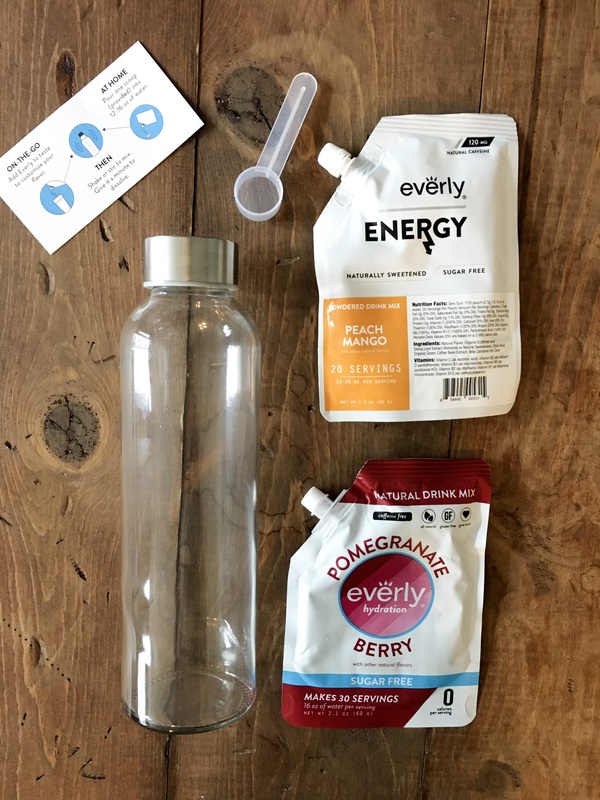 The kind team at Everly sent me two of their drink mixes to try, hydration and energy. You simply add one scoop of mix to water and can drink it on the go or at home. They’re naturally sugar-free and sweetened with stevia and colored with veggies. I have been loving the Peach Mango flavor. I’ve always been a water drinker, but lately I’ve been noticing I want something tasty mid afternoon or with lunch and these mixes have been perfect. When it comes to sweets I typically have cravings for something specific. This past weekend it was Peanut Butter Oatmeal Chocolate Chip Cookies, here is the recipe I used and LOVED! We cannot wait to make these again. My older sister actually first got me hooked on using za’atar spice blend. I’ve been out of it for a while though and my local store doesn’t carry any. Then I noticed this package at Mom’s Organic Market and was so excited to have it back and stocked in my pantry. It’s a mix of spices and sesame seeds and is great on chicken, with bread and olive oil, or in humus. I need to start getting more creative with my spiralizer. These Bird Food Energy Bites, YUM! Great afternoon snack. Added this Everything Sheet Pan Salmon to the Meal Plan for next week and I can’t wait! Going to get sweaty and try this 30 Minute Demi Lovato Workout. The weather is going to finally cool down this weekend so I’m looking forward to baking with pumpkin. 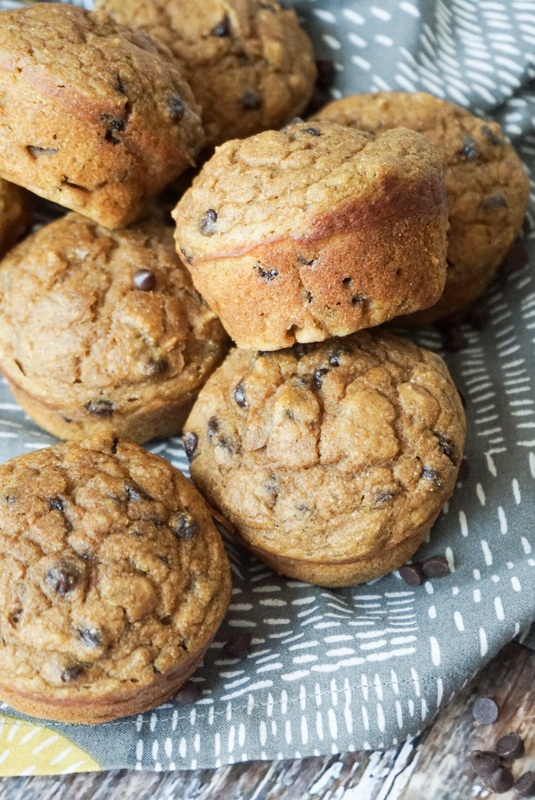 These Healthy Pumpkin Muffins are a delicious breakfast, you can enjoy your coffee with the Fall air. I’ve been feeling pretty sore from my workouts by the end of the week. And have been trying to spend more time foam rolling, here are 6 Ways to Use a Foam Roller. What other drinks do you enjoy during the day besides water? What’s a healthy or indulgent sweet treat you’ve eaten lately? Tell me something you’re loving this week. Peanut butter oatmeal chocolate chip cookies…YUM!! I now really want to bake lol. These looks so good. Definitely take some take to bake these this weekend, they won’t disappoint! Those new Vital Proteins flavors sound super yummy! The banana, cinnamon & vanilla is my new fav! Happy Friday! You look so happy to be on your foam roller. 🙂 I rolled my glutes this morning and I must say it felt GOOD. My neighbors made us pumpkin cookies so I am enjoying them right now! She made them with a box of spice cake mix, but you would never know it. Hi Happy Friday Megan! Def love rolling any part of my body, especially legs and gluten. And yum, I’m craving all pumpkin desserts now. 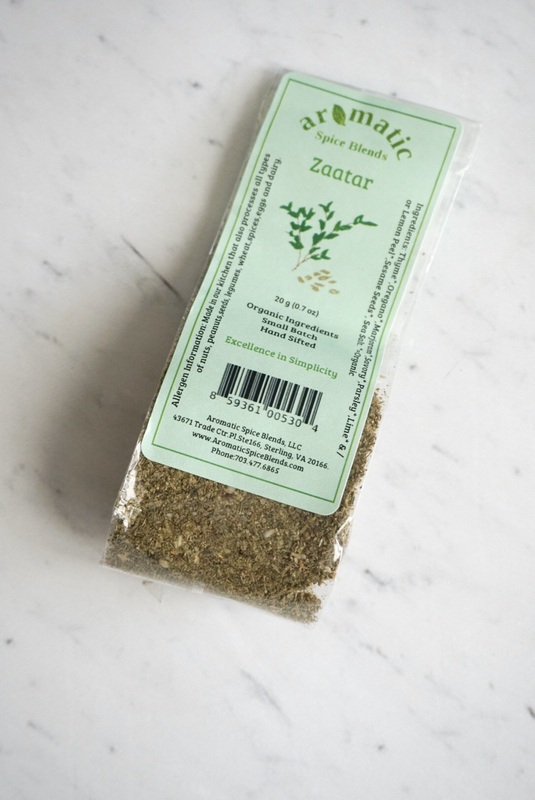 we love Zaatar spice over here too! I am trying to think up some new ways to use it. 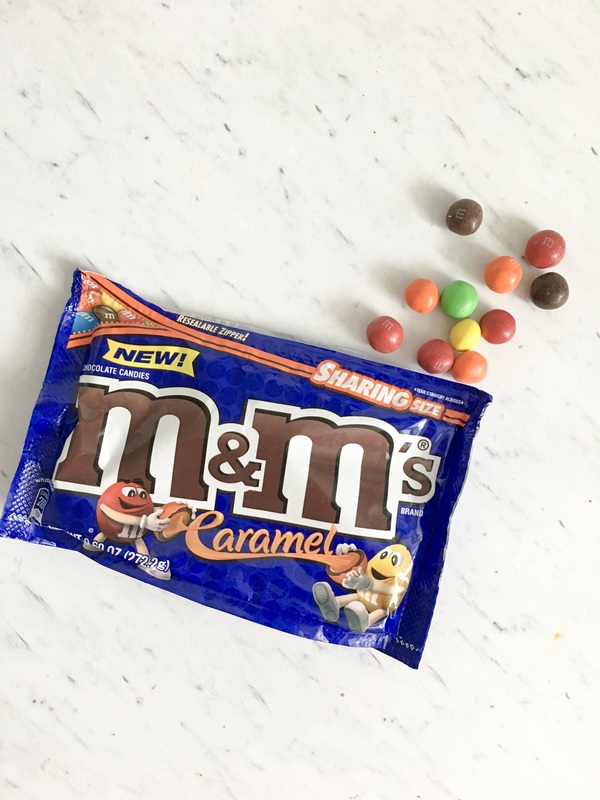 I was kind of afraid to try the caramel M & M’s bc I fear they are way to addictive! Haha so cute you let her decorate her cupcakes! And you must try the caramel M&M’s, they’re delicious. I need to try those caramel m&ms!! 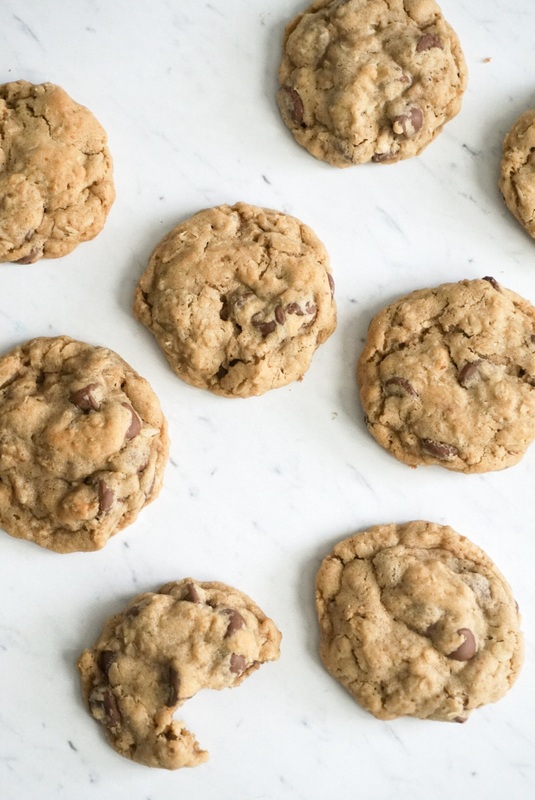 And those cookies look so good – thanks for sharing the recipe! This post is making me hungry! Cookies, muffins and banana bread. I’ll be catching up on This is Us tonight too! Eat some sweet treats while catching up, we’ll be doing the same 🙂 Happy Friday Sarah! I’m always sipping on crystal lite and la croix drinks! Those cookies look fantastic- the chunks in there are amazing! We always have La Croix in the fridge! What’s your favorite flavor? And omg the cookies were so good, chocolate peanut butter heaven! I baked oatmeal cookies last week, too. Man nothing beats the classic eh? OMG they don’t have them in Canada?!? I hope you can find them, if not I highly suggest ordering some, so good! And oatmeal cookies are so good, I had literally been craving them! Those cookies look amazing! I love seltzer water, and probably drink way to much coffee. Hope you have an awesome weekend! Lately I’ve been enjoying a lot of seltzer water too. I just love the bubbles. Have a great weekend Emily! So cool! I just discovered MOM’s organic Market this week! And to answer one of your questions, I picked up some Kombucha that was on sale there! I’ve been enjoying buying 1-2 for the week to have something a little bubbly/good for me at night (when I’m also thinking of wine ;). ) I’m visiting family and friends in DE this weekend that I haven’t seen in a few months so I’m excited!! Hi Amanda! Have so much fun in DE this weekend, hoping they have some beautiful fall temperatures there too! And I totally do the same with kombucha. I’ll pour it in a glass and pretend its a cocktail, haha. I’m always up for some m&m’s! Yes I like the plain in coffee too. I really like the flavored collagen in my smoothies, this Banana Cinnamon and their Mixed Berry have been my favs. Happy Friday Tori, hope you have a great weekend! Those cookies look amazing! We should put the M&Ms in them! Have a great weekend! I seriously thought of adding them! I’m thinking the mini ones would be perfect, totally trying it next time. Those cookies look yummy! I like combining oatmeal with pb + chocolate chip. And I love finding spice blends that you can use for so many things… I use this stuff called Jane’s Krazy Mixed Up Salt on everything! Yes I love finding spice blends that have clean ingreidents on can use on many things. That salt blend sounds delicious! Hi Catherine! That PB Oatmeal Chocolate Chip recipe is definitely a keeper! I highly suggest you make them, only thing is they’re addicting, lol. I can’t live without my vital proteins! SAME! I’ve been using it since June and am so hooked!